Thanks to the extra-deep v-neck this undershirt is invisible under your dress shirt even if two buttons of the upper shirt are left open. 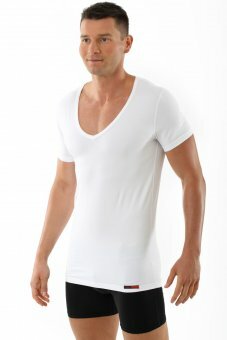 This deep-v neck undershirt has a close-fitting cut and is entirely sewn with flatlock-seams. The sleeves are particularly short so that you can wear this undershirt under a short-sleeve shirt or polo. In addition, this undershirt is extra long so that it stays tucked into pants. No neck tag - the tag is placed in a non-critical area of the undershirt. Highest quality hand-made in our manufacturing facility in central Saxony. Made in Germany.